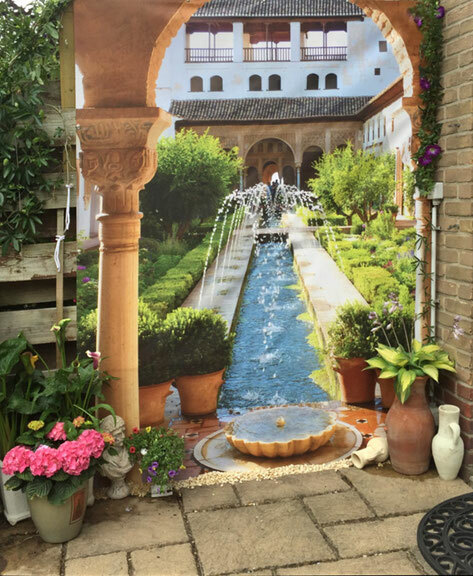 Use a canvas garden poster as if it is a painting. 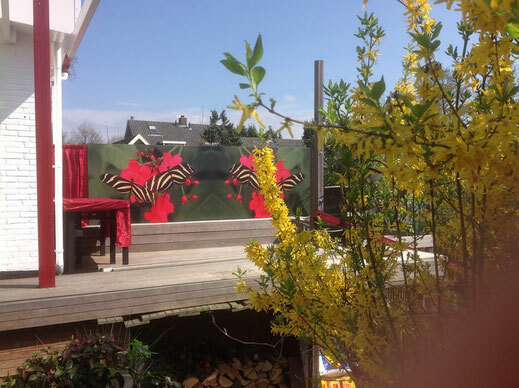 Place a combination of colourful garden posters of flowers or butterflies above your garden bench. If you have a modern garden the selection of abstract images will fit very well and give you garden more colour. 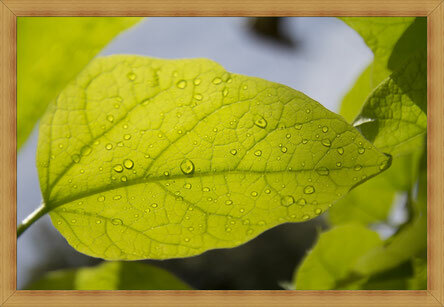 You can give you garden more expression by choosing specific season images which you change every season. This will give your garden a special effect. Be creative & original and decorate your bathroom with a nice canvas poster. The humidity is not a problem, because the canvas posters are "weatherproof". The same for your indoor pool area or wine cellar. Ugly garden walls are history with our garden posters. Decorate your entire wall and create more depth. Integrate will say that you put plants or other attributes that correspond with the image of the garden poster, in front of it. See the image on the left; this garden has been changed into the garden of the Alhambra the Granada! Be creative & original and buy an old door or a window frame with window shutters and mount it against your garden wall. Take the size of the inside frame and look in our image categories for what you would like to see behind this door and what the view is through this window. Our posters are made-to-measure ("cm" accuracy), so every poster will fit in your frame. The result will be amazing. 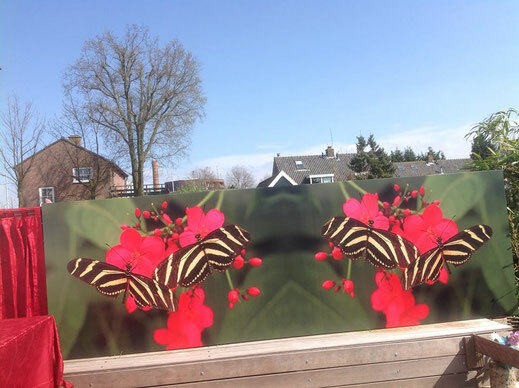 Place the garden poster in the frame, open the door and shutters and your special effect is ready! Your indoor swimming pool can be at the beach with our beach posters. Or what about the rivers and waterfalls that can end up in your pool. Create more depth and give more colour to your bathroom with the wall be covered with a waterfall. Give more depth to your wine cellar with our underground images in the category Historic Buildings. Are you an clothing shop owner? ; Create an atmosphere of the season of the kind of clothes you are selling and get the attention of the public that is walking by. Mount a big garden poster behind your showcase dummies. A nice beach poster behind your summer clothes collection and snow & ice behind your winter clothes collection, creates imagination and gets more attention. The butterfly image BF03169 mirrored and printed double on one poster.